A man who was arrested during Chicago protests sparked by the fatal shooting of two black men by police was released from police custody Tuesday. Ja'Mal Green had been ordered held in lieu of $350,000 bail Monday for allegedly striking a Chicago police officer and trying to disarm another. Activists and family members, who denied the accusations made against Green, raised funds and by Tuesday evening the 20-year-old's $35,000 bond had been posted and he was ordered to home confinement. He was released from police custody, but did not speak to the mob of media and supporters gathered outside the Cook County Jail. The Cook County state's attorney's office said Monday Green was charged with aggravated battery and attempt to disarm a police officer and resisting arrest. After bond was set, three women were taken into custody for shouting "black lives don't matter" and later released. Prosecutors told Judge Peggy Chiampas that Green threatened an officer Saturday after being told not to climb a fence. Green was allowed to continue the protest, but later struck a police commander. Green is also accused of grabbing the duty belt of a police captain about an inch from the officer's service revolver. It wasn't immediately known if Green has legal representation. Green has been in police custody since Saturday. Activists are trying to raise funds to bail Green out of jail and claim the bond is too high for the charges against him. "Thirty-five thousand dollars is too high of a bond for what he did," said Greg Greer of SCLC Chicago. Green's mother said Green was trying to help other protesters before he was arrested. "He never hit a cop, he's scared of guns so he never pulled for a gun," said Herlyn Oatis. 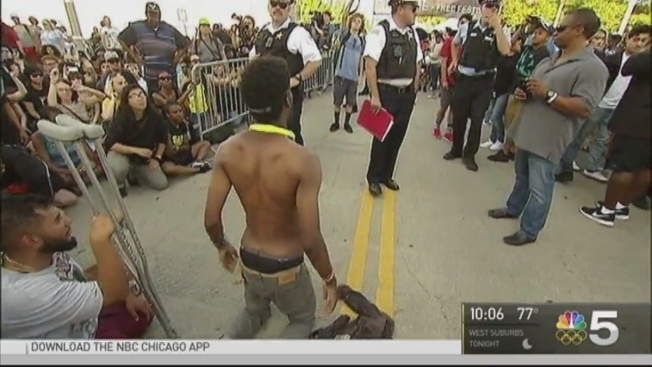 "All he was trying to do was help his other protesters that they were bothering." Oatis said her 20-year-old son became an activist as a young teen after he lost a friend to gun violence in high school. "A lot of kids are doing better because of him," said his sister Tacarra Dade. "They want to do something other than be out of the block selling drugs."